I came across these images whilst looking through the extensive collection of broadsides and posters uploaded to the archives’ flickr photostream . In different ways they both illustrate what was happening on the home front during the First World War. 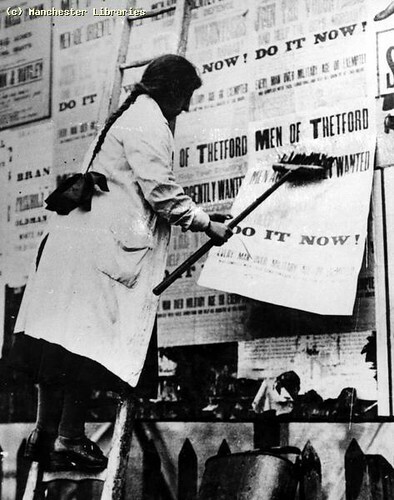 Here’s a woman taking on the role of a billposter in 1915. The posters themselves don’t reveal much about what was happening and it isn’t clear where or why the photo was taken. It does however show that women were doing jobs that would normally have been done by men during the war years. 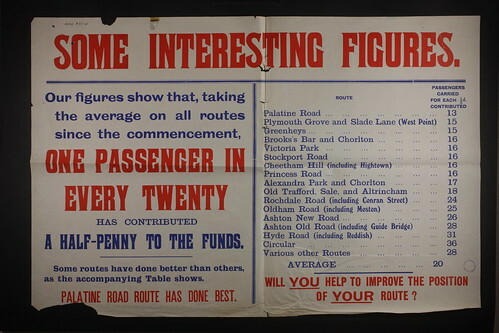 This second image is an information sheet put together to show which tram routes had raised most money for the War Effort. Donations by a proportion of passengers are presented in a competitive comparison table. The Palatine Road route represented the wealthier suburbs of South Manchester in those pre-student days. A ha’penny in pre-decimal days was worth about a quarter of a modern day penny. Our flickr photostream contains images that cover a wide range of historic documents and photos right up to the present day. There’s a great collection of WW2 era posters and photos. This blog is going to explore the stories behind the thousands of images and some of the documents we have that relate to WW1. We will be gradually making them available on flickr in the months to come.